For us, it’s more than numbers – yet I’ll share some with you. It’s more than operational efficiency – we deal in experiences not assembly lines. Before dollars and cents we think about ingredients and collaboration. . .
Every day, millions of small bottles are hurried from hotel bathrooms, partially used, and tossed in the trash only to be replaced by new ones, filled to the brim from the factory. Yet these are destined for the same fate, one use, maybe two and then into the trash. For about 10 years, The Lenox has been collecting the partially used shampoos, conditioners, and soaps, and offering them to the nearby Boston Rescue Mission for their guests (homeless people who come for a safe, warm night’s sleep and a hearty meal). En vogue recently are the Clean the World and Global Soap options, which take the bars of soap from hotel rooms, box them, ship them to a factory, process them, and re-sell them to various third world or in need destinations. Good, but not great. While we like our local connection to the Boston Rescue Mission and the immediacy of the impact, it is not an excuse to be wasteful. Therefore, for 7 of the past 10 years that The Lenox has been donating all of the partially used amenities (not just soap), we have also been looking for a better way. Enter, Mosaic. The sleek yet practical solution that we’ve introduced into our guest room showers that allows us to offer the highest quality without the constant waste. Close to 200,000 individual bottles were donated by The Lenox last year, and thrown out by similar size hotels all around the country. It takes 5 hotels to reach one million bottles of waste – awful even before you consider that most of those bottles still have more than half of the shampoo or conditioner still in it. It is not long before the plastic bottle count gets into the billions and the excess product begins to fill Olympic swimming pools. No more. 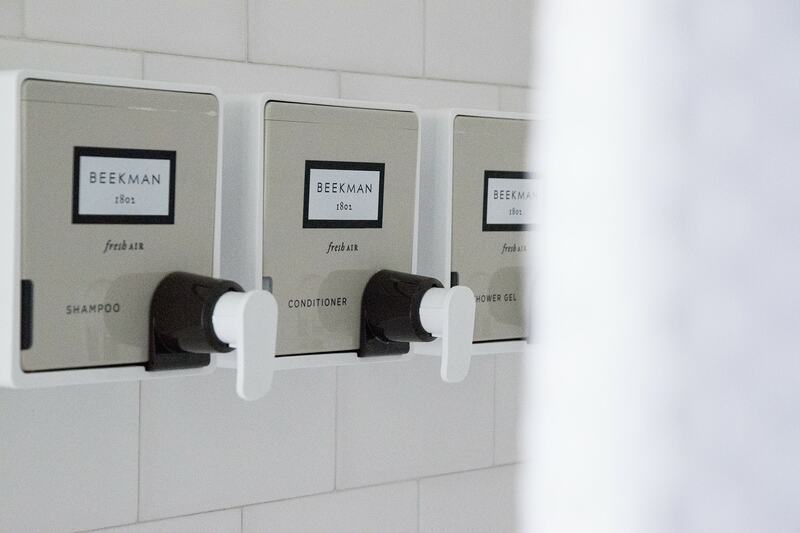 In conjunction with a boutique bathroom amenity creator, JRS Amenities, and lifestyle brand out of upstate New York, Beekman 1802, The Lenox created a privately labeled, luxury dispenser that we are excited to present to our guests. The introduction of the Mosaic dispensers has also allowed us the freedom to hand pick a product that we want, that we believe in, and that is rooted in community. We know the farm that is the source of the amenity line. Literally we know the goats by name. We’ve seen the chickens on that same farm and have had breakfast with the farmer that tends to the animals while the Beekman Boys are creating the amenity line and revitalizing a small town in the process. If you’re wondering what it is you are seeing on the wall of your shower, let me tell you. It is Genuine Responsibility and Genuine Hospitality. We care about you, and want you to share a hint of the care and attention that goes into your experience.